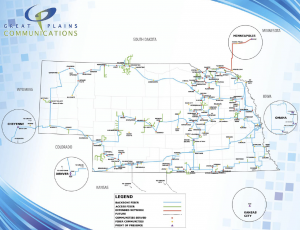 Nebraska's Great Plains Communications is adding yet more fiber to its network. Today they announced an expansion southward to Kansas City into the Netrality carrier hotel at 1102 Grand. This is the fourth network expansion for Great Plains Communications this year, each of which has taken their network into an adjacent market outside of Nebraska via unique and diverse routes. They started off the year with an expansion to the west through Cheyenne into Denver, then moved on to South Dakota and Minnesota to the north and then just last week Iowa to the east. That pretty much covers the immediate adjacent targets, but I'll bet they have designs on Chicago and Dallas on the drawing board someplace. Great Plains hasn't shown up on my M&A radar, and has until this year been tightly focused on Nebraska alone. Now that their network is reaching out, I expect we'll be hearing a bit more.